Bad product ratings and reviews are always a nuisance. Especially 1-star ratings can potentially drag down a product’s average rating unless it already has a solid base of reviews. But even if there’s already a lot of good ratings for the product: Many users specifically check the negative reviews to get an idea what issues could potentially arise with the product. This way, bad reviews can directly lead to a drop in sales. As a seller, you naturally want to avoid this and wonder: What should I do about unfavorable reviews? What can I do anyway? 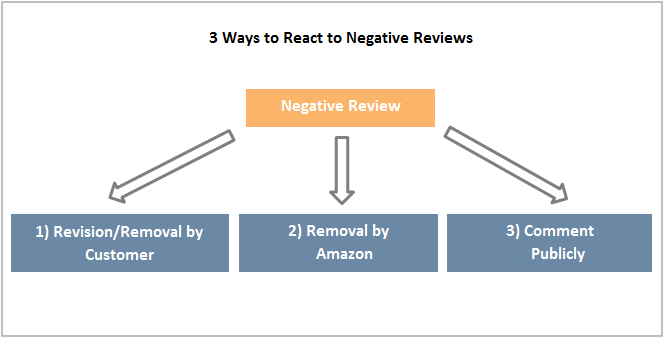 In this post we outline the three main ways of counteracting negative reviews on Amazon. For each measure we’ll assess the effort that’s involved, the probability of success and the expected outcome. If it’s possible to contact the customer directly, the first-best option is to do so and try to get them to revise or delete their review retrospectively. If this doesn’t work, you can try to have the review deleted by Amazon. These two solutions are the most favorable for sellers, but in many cases they can’t be achieved or won’t help. The third alternative that remains is to publicly comment on a review to try and reduce the damage to the product’s and/or seller’s image. Idea: Product reviews can be modified or deleted by reviewers (in most cases these are customers) retrospectively. In order to influence a negative review, sellers can try to get in touch with the customer and ask them to edit/delete their review so the damage will be undone. Outcome: In the best case scenario, a negative review is turned into a positive one which goes from harming to helping the average rating of a product. When this isn’t realistic, it may at least be possible to achieve the removal of the review by the customer. This way you do lose one review, but you also lose its negative effect. Success Probability: The overall chance for this option to succeed is moderate: Contacting reviewers can be tricky to impossible if a pseudonym was used that won’t allow you to trace back to the real identity of the user. If direct contacting is off the table, the only alternative is to try and indirectly contact the author by publicly commenting on their review. If this way of contacting them is successful, chances are they will show some willingness to cooperate with regards to their review. Effort: The effort required for this procedure is relatively high: first you have to conduct some more or less intensive research to make contacting possible and in turn this contact and conversation with the customer has to be made and in certain cases some compensation will have to be delivered. The biggest challenge with this option is to find out the contact details of the reviewer. Since many reviews are written using pseudonyms, this isn’t always possible. Sellers can try to identify the reviewer by comparing the pseudonym and date of the review with any received orders of the product in question. For “verified purchases” you can be sure that the reviewer is actually an Amazon customer, which can be helpful, too. If this isn’t successful, you can still use the comment function and try to get the reviewer to contact you instead. Once the reviewer has been identified, you can contact them by telephone, via email or by post and try to help them solve the problem that they had with your product. If you can resolve the issues, chances are high that the negative review will be edited or deleted. Just bear in mind not to offer customers any incentives that may constitute a violation of Amazon’s guidelines. The reason for the bad review has been eliminated to the customer’s satisfaction. Don’t offer compensation or resolving the issue as an incentive to remove/edit the review – try to satisfy the customer first and then talk about the removal/editing of the review in question. Underline how important reviews are for you as a seller and how much damage bad reviews can cause – in direct conversation, many customers will agree with your concerns and take back the rating/opinion they gave “in the heat of the moment” when they were annoyed with their order. Some users are unaware that third-party sellers are involved with the sale and delivery of the products they purchase, but believe that negative reviews are a way to strike back against a big, anonymous corporation. If you manage to explain to them that a private seller or an SME is on the other side of table, they will be quite likely to reconsider their action and may remove or adjust the product of their outburst. Reviews can still be edited or deleted retrospectively by the customer. 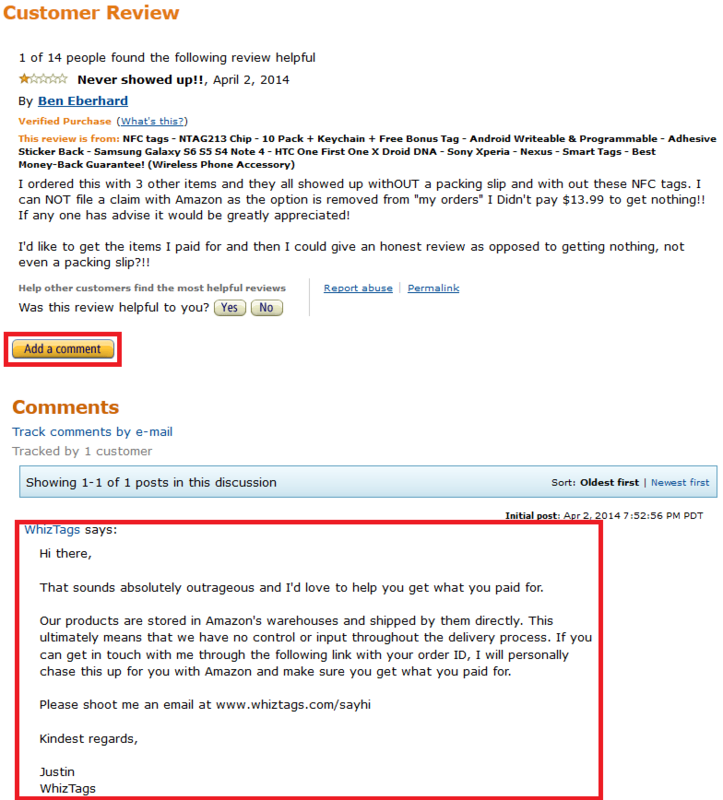 Idea: You can try to have a product review deleted by Amazon, if it does not comply with the review guidelines. Outcome: A removed negative review is a good result: Even though you lose one review, you also lose the negative impact. Success Probability: It is not very likely that Amazon will remove a review. Only if the review in question violates Amazon’s review guidelines in obvious ways, it might be deleted. Such a violation is only the case in extreme cases (e.g. harshly inappropriate or deceitful reviews). The mere fact that a review is unfair is not enough to have it removed. Effort: Requesting the removal or revision of a review is fairly easy: with a few clicks and by indicating a reason for the request you can report a review to Amazon. Asking Amazon to remove an inappropriate review is done with a few clicks. Go to the product details page of your product, click on the questionable review and click “report abuse”. In the pop-up window that will open, indicate the reason for your request. Alternatively, you can send an email to community-help@amazon.com and indicate the ASIN of your product, the date and time of the review, the name/pseudonym of the reviewer and ideally a link to the review. To increase your chances of success you should indicate in which way the user is violating the review guidelines. An unhappy customer writes several negative reviews for the same product. Comments on other reviews displayed on the page. Other reviews could be edited or deleted without notice. Idea: By commenting on a negative review on the product page, you can give your opinion on the issue and put the review in the right light. Explain what measures you have taken to solve the problem or why there won’t be the same trouble in the future. Outcome: By commenting, a review will not be changed – it will remain visible as is, and will still impact the product rating average. However, a comment can help to mitigate the negative consequences as the criticism will be put into perspective: E.g. if the seller makes clear what actions have been taken to tackle the problem and how its occurrence will be prevented in the future, then potential buyers may be convinced to purchase even though the bad review is still visible. Success Probability: There are no barriers to commenting on a review. This action can be taken even if all else fails. Effort: Moderate. No negotiations or compensations are necessary. To give appropriate responses though, texts should be rather customized than from a template, which requires some care to detail. To comment, you simply need to click on the review in question and click “add a comment” (log-in is required). Make sure users can clearly identify you as the seller e.g. by using a clear signature. This is mostly the case when something was criticized that was actually pointed out in the product description (like contents/scope of supply, colors, sizes, materials etc.). This is particularly annoying for sellers – the customer should by all means be asked to remove the review after they have learned that the mistake was on their part. Despite the frustration, you should always remain polite and factual and explain why the criticism is not justified, e.g. by indicating the exact location of the overlooked details on the product page. Despite the effort, the first goal for sellers should be to try and contact the customer directly. Once the approach was successful, a bad review will in many cases be removed or even turned into a positive one. The next best solution would be to have the bad review removed by Amazon – but this will only work in certain cases where Amazon considers the review a true violation of its guidelines (such as foul language, deceitful reviewing by competitors etc.). The third option is to comment publicly on an unfavorable review. It will remain visible and still lower your rating average, but at least you can give your opinion and show users that you take their concerns seriously and that you take appropriate measures to fix the problems that occur. This way it’s possible to eliminate some of the uncertainty caused by negative Amazon reviews and hopefully convince some of the skeptical users to purchase your product. Notwithstanding the aforementioned countermeasures, dealing with negative reviews begins at an earlier stage, namely with a good product and customer service. The primary goal should always be to avoid negative reviews altogether and eliminate the main causes why they occur. Focusing on this will save you a lot of effort and boost your sales in the long run. Decent review management can become quite time-consuming if you monitor a range of products. To reduce the effort, it’s useful to prepare a set of standard texts you can use and adapt where necessary to respond to criticism. The main focus should be on the most harmful 1-star reviews, which will be read buy a lot more users than 2-star ratings for example. Get notified immediately when you receive new Amazon product reviews. Focus on the most damaging reviews and take action directly in Sellics. New users can signup for a 14 day free trial and try all Sellics features for free!